Every scientist usually can describe an event or an admired historical figure as their pivotal point of inspiration which led them to embark on a scientific career. I will admit there were two points of inspiration: the first was Jacques Cousteau while watching his program Undersea World of Jacques Cousteau. The other (and please don’t laugh) was reading about the intellectual duel and collaboration between two of the greats in astronomy and mathematics: Tycho Brahe and Johannes Kepler, two historical figures responsible for our modern-day understanding of the universe and planetary motion. For some reason I had romanticized the study of science, envisioning days in the laboratory wearing renaissance garb while striking medieval vogue poses (just kidding). But back then, accurately determining planetary motions and mapping the stars was a real big deal, as trade ships would rely on the positioning of stars as their heavenly GPS system. Otherwise you might be trying to establish a new trade route to India and wind up somewhere… say America. 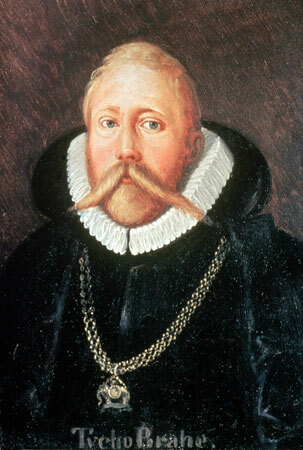 Tycho Brahe (1546-1601; born Tyge Ottesen Brahe) was a Danish nobleman and scientist who made the most accurate measurement of planetary motion and positioning of the stars, which enabled another great astronomer, Johannes Kepler, to deduce the laws of planetary orbits. His measurements allowed Kepler to prove Copernicus’s sun centered theory (Earth revolves around the sun). An interesting history of Brahe, The crazy life and crazier death of Tycho Brahe, history’s strangest astronomer, gives some in-depth look at this intriguing historical figure. Now back then science, as is the case now, costs money; and the two ways to get that money was either find a wealthy backer (like a king) or have a rich uncle who leaves a great inheritance. Well Tycho did have a rich uncle who left him a lot of money, but instead of just sitting around spending it on jewelry, he used a great portion of his inheritance to build his 1st observatory to make his important measurements and also discover a supernova (published in De Nova Stella), breaking the dogma at the time that stars never changed their appearance or position. iii. Ritu Levi Montalcini, M.D. : Dr. Montalcini discovered nerve growth factor together with Stanley Cohen (both awarded Nobel Prize). After earning an MD in Turin, Italy in 1938 she was unable to work as Mussolini banned Jews from holding professional positions. So she moved to Belgium but when the Nazi’s took over she fled back to Turin and made a secret lab to study the development of neurons in chick embryos. Now as many government science budgets are tightening some scientist are returning to self-funding and alternative models in order to continue their research. One such example is the Ronin Institute, founded by Dr. Jon Wilkins, Ph.D., where scientists who may not have institutional support, band together in a sort of virtual Institute which supports publication and grantsmanship. The mission and values of the Ronin Institute (which can be found here) includes creating new models for the conducting, funding, collaboration, and dissemination of scholarly research to get researchers back to what they do best: RESEARCH. A wonderful and inspiring article, written by Samuel Arbesman and co-authored by Jon Wilkens, can be found in Wired magazine. One of us (Jon Wilkins), has set out to promote and support independent scholarly research through the founding of the Ronin Institute. The Ronin Institute acts as an aggregator for the fractional scholars of the world, providing an institutional affiliation, connection with other fractional scholars, and support for conference travel and grant applications. When people are doing something that they are passionate about, they work harder and produce a better product. Thus, underemployed scholars represent in some sense a good that is currently trading well below its actual value. By providing a mechanism for those who wish to conduct research, we can allow these people to engage in their passions while growing the base of scholarly knowledge, which in turn has the potential to create further economic growth. Through the Ronin Institute, we will be harnessing the skills and talents of thousands of underemployed researchers. Two other great articles on “gentlemen scientists” or self-funding scientists can be found at the Singular Scientist blog post entitled “Self-Funding in Science” and a 1998 Science article by Jon Cohen entitled Scientists Who Fund Themselves. In each case, scientists felt freed up from the financial overhead accompanied with big institutions and realized more time for their research. The passage of the JOBS act has relieved some of the pressures off obtaining funding for companies through crowdfunding mechanisms. Scientists are also turning to crowdsourcing mechanisms to fund their research. An article in the Washington Times (Scientists discover ‘crowdfunding’ as a way of replacing research grants) highlights some of the successes and science-related crowdfunding sites that exist. Dr. Elizabeth Iorns, breast cancer researcher and founder and CEO of Science Exchange, an online marketplace for ordering science experiments from various nationwide and worldwide labs, explains in a three-part Nature blog post “Research 2.0.1: The future of research funding” how the traditional government-based grant-funding model may transition into a more crowdfunding model. For example Science Exchange allows you to order common laboratory procedures (for example immunohistochemistry or bioinformatics analysis or gene sequencing) from a list of participating labs in the marketplace. Prices are usually reasonably priced. The last piece of the puzzle is finding rented space and equipment to do research. A new type of laboratory space, small, nimble, and priced and equipped to fit the independent researcher is cropping up. Termed biohacker labs or hackubators, these small rented communal spaces are different from the traditional bio-incubators or science centers which sprang up decades ago to foster the biotech revolution. This phenomenon is explained quite nicely in a Science article by Virginia Gewen “Biotechnology: Independent Streak”. These spaces can go for $100-400 a month, much less than $900 a month for incubator space. Most of the investigators highlighted in the article get funds through crowdsourcing.